When interest in boxing wanes, Reverend Fred Sultan (Samuel L. Jackson) , an unscrupulous boxing promoter, brings back the only man (Peter Berg)) ever to beat the current heavyweight champ (Damon Wayans) as an amateur. Hyped to the hilt, the Reverend sets up the impending battle as the fight of the century. Flashy, funny and featuring an all-star cast - Jeff Goldblum, Jon Lovitz, Jamie Foxx, Corbin Bernsen and Cheech Marin - this critically-acclaimed comedy deliversia knock-out punch to the world of professional boxing. Okay, I must admit that I don't know how on earth this movie escaped me at the box office because it's easily one of the most entertaining movies that I have seen in 2005. 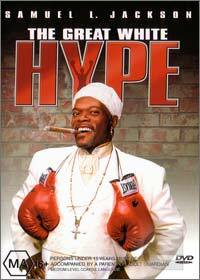 Samuel L. Jackson plays the extremely reminiscent Don King character who happens to be a reverend. With everything destined to go wrong for the Sultan, this movie features the dark side of boxing with a healthy sense of (no pun intended) black humour. It's funny, it's insulting, it's the Great White Hype! The video and audio quality of this movie is exceptional and is featured in a presentation ratio of 1.85:1 16:9 enhanced that is exceptionally clear on our 82cm Philips widescreen television with crystal clear audio of Dolby Digital 5.1. Unfortunately when it comes to extras, this disc is sorely lacking them and I must admit that this would of been the perfect movie to have them.